Saturday Night Live is a New York institution. You can complain all you want about its current quality, but it’s not going anywhere. SNL also holds a unique place in the world of comedy in that it is more like a sports team than a television show. Like any team, it depends on the efforts of everybody involved, as opposed to just one person. Despite this, it is devastating whenever a power player leaves. To me, Bill Hader leaving SNL was just as big a loss as Derek Jeter leaving the Yankees. By the way, did you know Jeter is leaving the Yankees? They should do a few stories about it on the news. Anyway, like any good New York team, be it the Giants or the Knicks, SNL went through a bit of a rough patch. Every year seems to be a rebuilding year for SNL, but this year Lorne Michaels really seems to be taking it seriously. Multiple people were fired and Weekend Update replaced an anchor. Based on the season premiere, hosted by Chris Pratt, these gambles will pay off in a big way. The premiere played to Chris Pratt’s strengths. Yes, Pratt is now a movie star and a household name. Yet, he still has that goofy and awkward charm that has made him such a lovable character on Parks and Recreation. Also, it seems weird that there was absolutely no mention of the final season of Parks last night. Failed synergy opportunity on the part of NBC. Maybe they were busy thinking of more magazine covers to put James Spader’s face on. One of the most talked about changes at SNL this season was the Weekend Update shakeup, in which Cecily Strong was demoted and Michael Che was re-hired after spending a few months at The Daily Show. Che is a great comedian and this job is perfect for him. Meanwhile, Jost already seems a lot more comfortable than he was last year. I think he has a Seth Meyers deadpan delivery that he is fine tuning now. Strong’s exit from Weekend Update allowed her to come back as The Girl You Wish You Hadn’t Started A Conversation With At A Party. It was a welcome return. 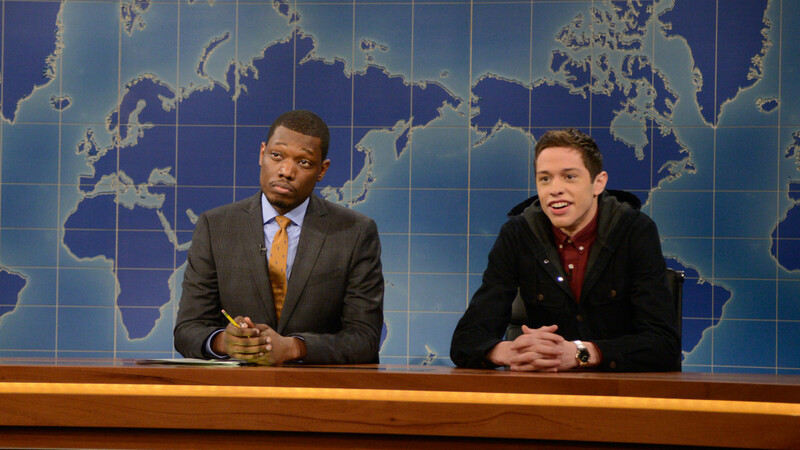 With just one episode, newcomer Pete Davidson showed that he will be the breakout of the season. At the age of 20, he is cooler now than I will ever be in my entire life. The second half of SNL has always been my favorite, because it is when things can get a little bit weird. In that regard, last night was an embarrassment of riches. While the NFL sketch was a little too close to Key & Peele for comfort, it took on a funny and timely new angle. By far the best sketch was the digital short, which was a cheesy 90s sitcoms filled with non-sensical non-sequiturs. It seemed way too weird for prime time. But luckily, the audience ate it up. SNL has a lot of great sketch shows to compete against now. One way it can have a great season is if it makes the first half just as weird as the second half. I feel the same sense of optimism for SNL that I do every year. This time, it feels less blind. This episode’s one big flaw: a serious lack of Kate McKinnon. Come on guys, don’t be afraid to put her in every sketch ever. This entry was posted in Uncategorized and tagged Cecily Strong, Chris Pratt, Colin Jost, Derek Jeter, Kate McKinnon, Lorne Michaels, Michael Che, NBC, Pete Davidson, Saturday Night Live, SNL, Weekend Update on September 28, 2014 by ian0592.